Weirdest Quirks of Your State DOT? There are a lot of quirks coast to coast that most of us don't get to see, until we visit the state. For instance, those weird jughandle left turns throughout New Jersey. I'm curious what's the weirdest stuff in your region? Re: Weirdest Quirks of Your State DOT? "School SLOW Crossing" signs, and various other three word phrases. Driving in the breakdown lane being legal in some cases. In Alaska, lots of state-maintained roads but very few of them have route numbers (only a dozen numbers in use, 1-11 and 98), and route number markers are scarce or non-existent on the rural numbered routes. Not so much the DOT's doing, as that locals in Alaska (like their counterparts in the Canadian Arctic) really don't give a crap about route numbers. Another quirk is that milemarkers follow named, rather than numbered, routes. For example, driving south on AK 1 from Anchorage, the milemarkers descend to 38, then start ascending again on the other side of Tern Lake Junction as AK 1 switches from one named route to another. AK 2 does two milemarker resets, in Delta Junction (WB from 1422 to 266) and Fairbanks (WB from 362 to 0). In Washington State, WSDOT has a few odd quirks: inset, center-aligned exit tabs (except in SW); welded-box sign gantries (never seen this anywhere else); black-on-white HOV signs (once common but now a party of one). There's also no sign salads on state routes. All route guidance is through guide signs. In British Columbia, flashing green orbs for pedestrian crossings; 8-inch arrows are still the norm as well, at least near-side. Intersections with multiple signal body colors aren't uncommon either. “Bypass Lanes” to allow traffic on two-lane roads to pass cars waiting to turn left. 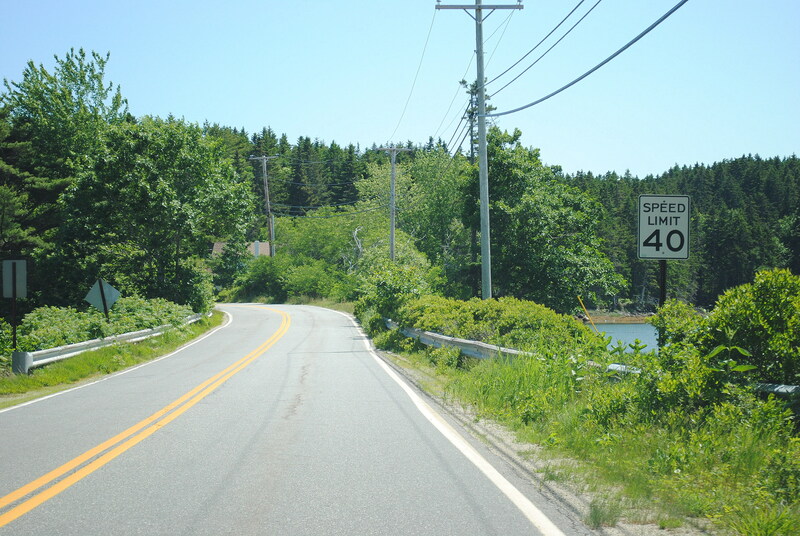 In recent years, Maine has become less unique in their signing practices, both for the sake of cost saving and conforming to MUTCD standards. One thing that I haven't seen elsewhere, however, are the wide use of weather related speed reduction signs. During severe winter weather, both MaineDOT and the Maine Turnpike Authority reduce the speed on all of their interstates to 45 miles per hour (40 in urban areas), and will activate these signs that flash the speed on the LED panel. I'll use this thread to show some quirks that used to be common throughout Maine, but have since been abandoned. Maine's custom font, LeHay. 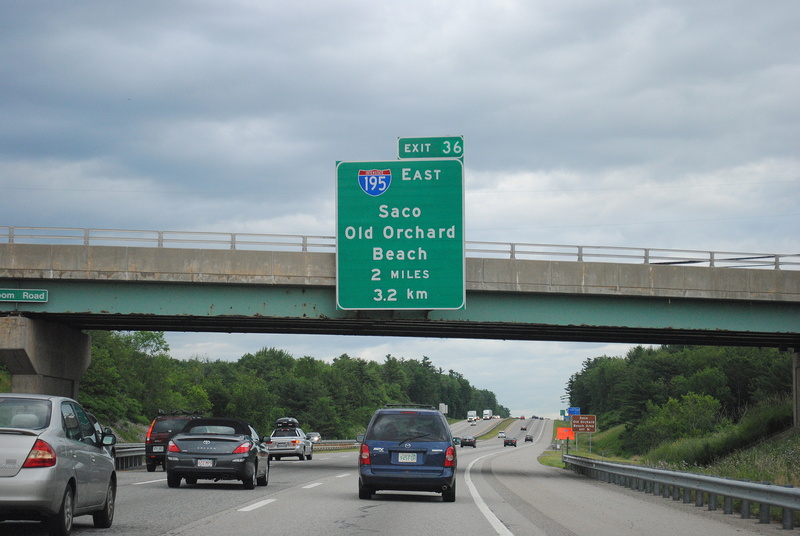 The font that was inspired from the late MaineDOT sign shop employee of the same name, was used on all signage throughout the state up until at least the late 1980's. Its most obvious features being the extra loopy '9s' and notched '2s.' As you can expect, they had to stop using the font for MUTCD reasons, but somehow were able to sneak it onto a few select signs up until several years ago. If you look closely, you'll find LeHay on signs such as I-95 shields (and only I-95, not any of its 3di's oddly), speed limit signs, and freeway prohibition signs. 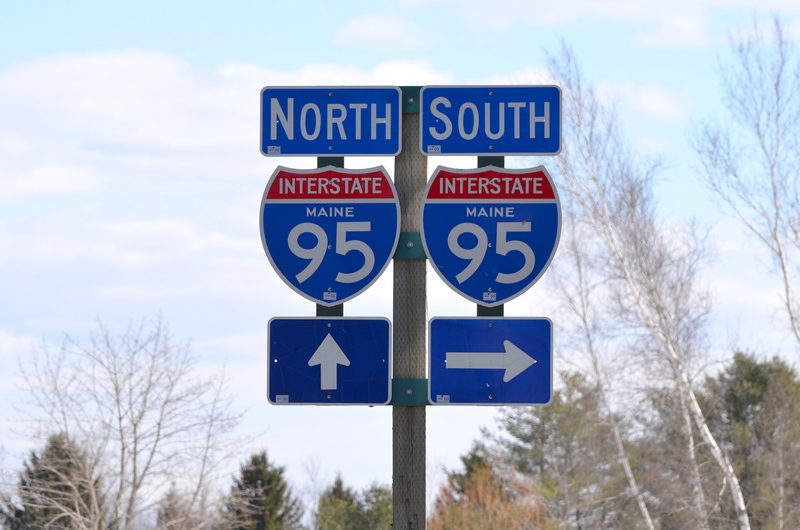 You'll notice with the I-95 shield and speed limit signs, MaineDOT switched the numerals to highway gothic, but kept the text portion LeHay (less obvious). As of late, all of this is no longer done. Maine used to, and still does currently, use wooden posts for a decent portion of their non-freeway (Maine Turnpike excluded) signage. In the case of route shield sign salads seen at route junctions, the wood members connecting all of the signs together were painted forest green. 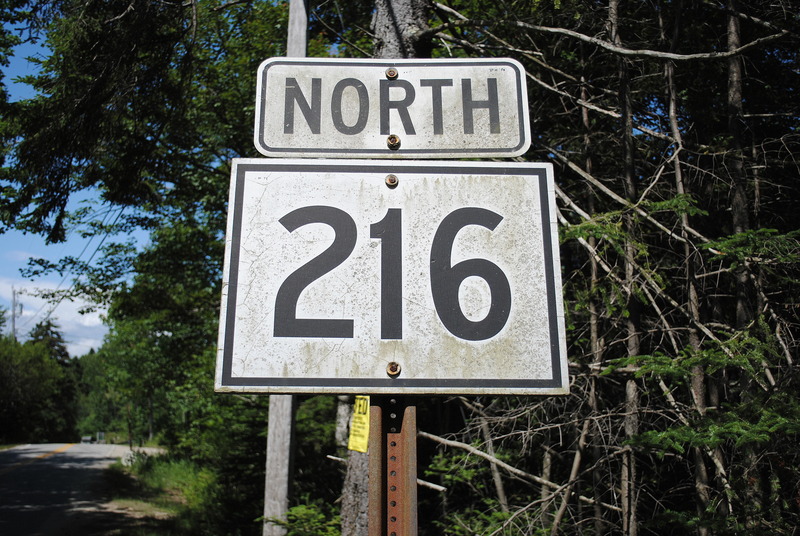 An example seen at the US 1/ME 220 junction in Waldoboro. 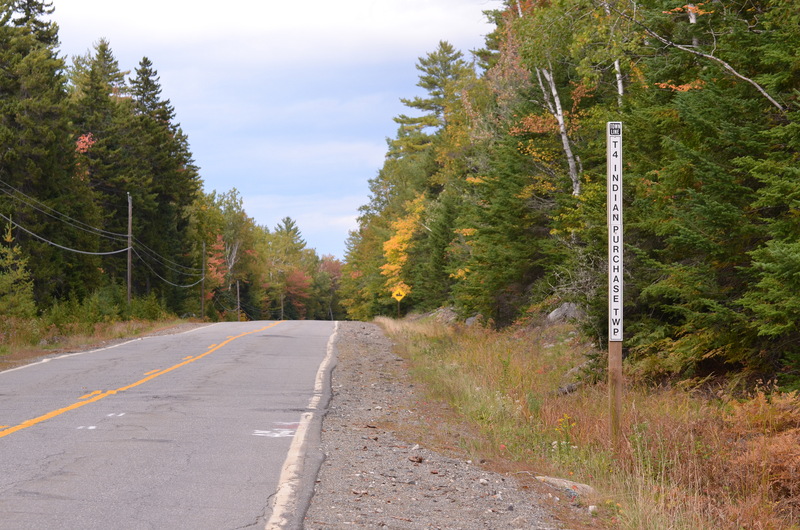 In addition to this, MaineDOT would paint the backs of all of their larger plywood signs in the same forest green color. These practices were abandoned due to unnecessary labor. 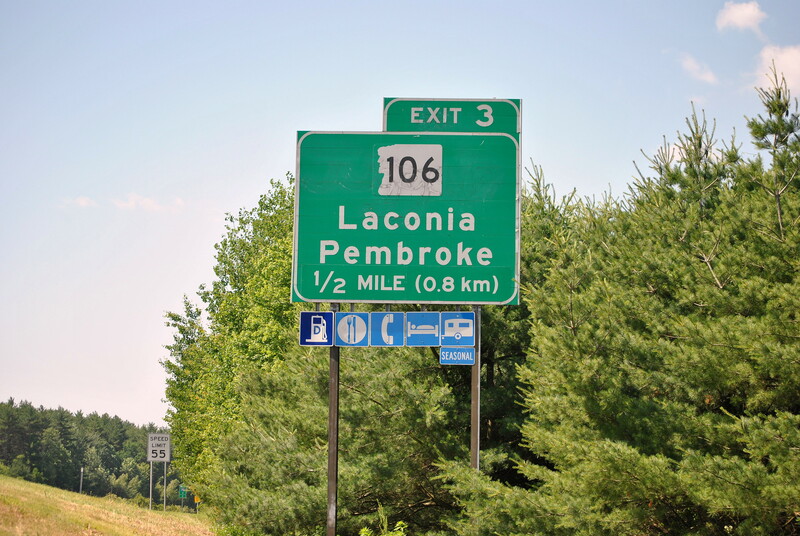 The use of both metric and imperial units on BGS's along the Maine Turnpike. Unfortunately, the last of the bilingual unit signage is currently in the stages of replacement. New Hampshire used to do this also, where the metric units were written in parenthesis. 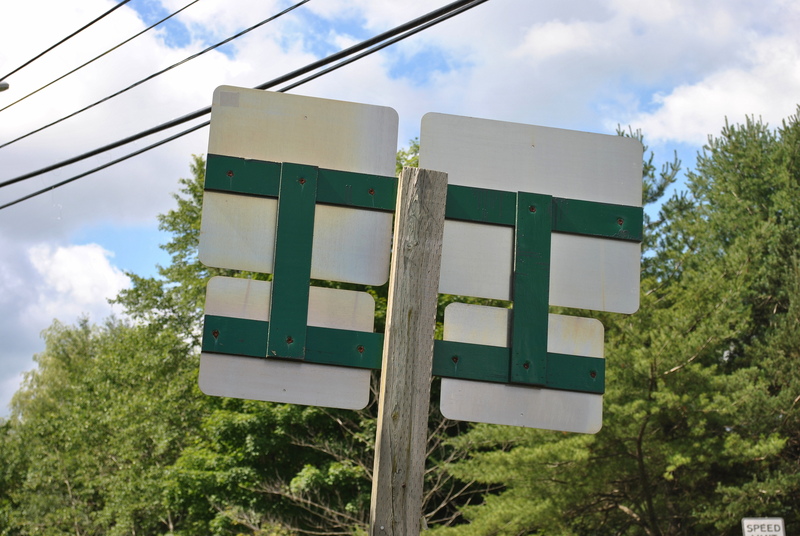 Both Maine and New Hampshire once used vertical town line signage. - Though route decommissioning occurs everywhere in some form, the haphazard piecemeal relinquishments are endemic to surface street routings of state routes (i.e. Route 1 near Santa Monica). California has yet to establish a new route of any form (even one with a recycled number) in almost two decades! This is not the only state where routings have some legislative basis, though it seems like in-the-field route signage is tied too closely to specific text in legislative route definitions, rather than being focused on navigational ease first. - US and state shield cutouts! - As California heavily invested in button copy decades ago due to durability, they were late to the retroflective trends other state DOTs got into in the early 90s, so the continued use of 40-50 year old BGSes throughout the freeway system is notable even as modern sheeting has finally become commonplace here. - Maybe less true than in the past, but due to the fact many California freeways were built before the Interstate system (or at the very beginnings of it), local control cities remain prevalent (i.e. "Hollywood" for US 101 in East Los Angeles, "Pomona" for Route 60). While Iowa only has as much sign as necessary to show the arrow and that's it. Speed Zones at exactly 1/5 of a mile in MN. MN Has just too many signs as it is. Alabama seems to put more left-lane drops than I've seen elsewhere, forcing you to merge right much more often than left. Ramps, flyovers, side-streets, highways, interstates....doesn't matter, you're probably merging right. Natural exceptions for entrance ramp ends at an expressway/freeway-grade road. The signs on bridges going over an interstate: The road name and a miniature shield (good), mileage point (ok), and a blank interstate shield for no reason (huh?). 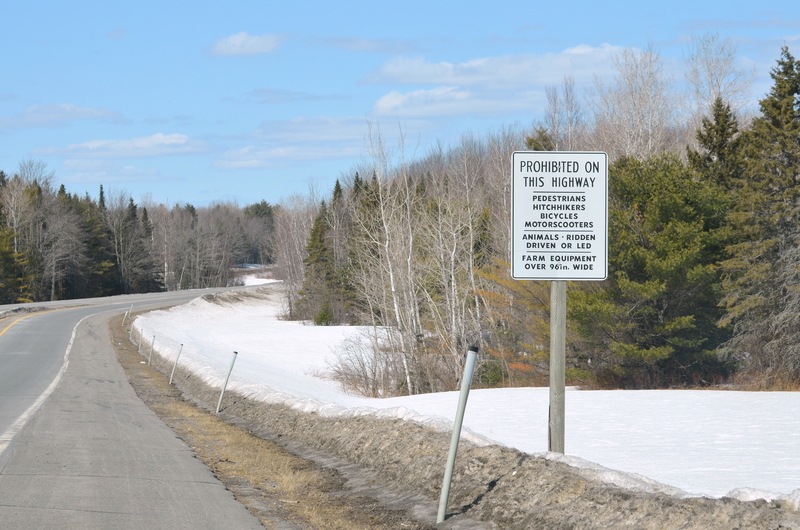 I think there's a few on other limited-access highways, but there's only a handful of those. After that, I can't think of anything else that's truly unusual, other than some counties with hundreds or even thousands of county route shields. MA: the state where everything is a state route. Shield error after shield error after shield error. For instance, those weird jughandle left turns throughout New Jersey. You can add at-grade loop ramps for left turns as well. If you think California is bad, you obviously haven't seen Catalonia. They use a totally different signage system to both Fomento (Spain's transport ministry) and the other communities, resulting in two separate systems being used at the same time: one on national highways, another on regional roads. They also sign their top tier regional highways in red, like national highways, as opposed to orange as used elsewhere, and if one gets referred to in a national highway it gets signed in orange (like elsewhere). Another quirk seen all across Spain is that regional roads are tiered in order of importance: there are the orange highways, then the green roads and the yellow local roads. The last one should also be used by provinces, but again there is a plethora of colors to see depending on which province is one. I'd argue that other states don't have enough signs. It's also worth noting that Minnesota was a pioneer in what became the MUTCD. - Town and county line signage posted parallel to the road (excluding what's on the Interstates). - Reference markers that are similar to but not the same as New York's. 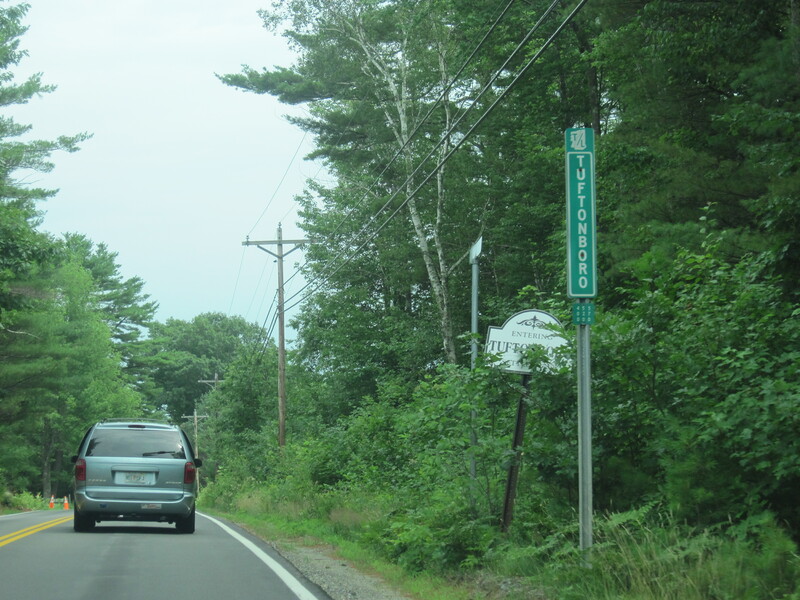 Also, unlike New York (AFAIK), Vermont also uses reference markers on several Class 2 Town Highways, specifically those that were Federal-Aid-Secondary under the old Federal funding rules. - 0.05 milemarkers on the Interstates (though I've noticed they're not getting replaced when lost/missing). - State (and U.S.) routes as Class 1 Town Highways in village centers. - "Through Way Begins" signs. Worth noting that all new Iowa installations I've seen in the last couple years have used MUTCD standard arrows. I agree with froggie about this. The thing that comes to mind for me about VDOT (Virginia) is their near-religious obsession with restricting right turn on red to the far right lane only, and posting signs about it, but the signs’ wording and placement can be quite inconsistent even within a single intersection. I have not seen nearly so many “right on red from curb lane only” or “no turn on red this lane” in other states. Also, while admittedly dual left-turn lanes where a left on red is permitted are rare, they do exist, yet VDOT does not, as far as I’ve ever seen, prohibit the left on red from lanes other than the curb lane (could be because most drivers don’t know left on red is legal at all). Series D and full-width exit tabs on BGSes. These stopped being put up around 2008 when we switched over to more-or-less MUTCD-standard ones, but a lot of them haven't been replaced yet. The "all signs the same height" thing is still a thing, though I know some other states do that too. And, of course, we can't forget the rule about all US routes being posted alongside state routes. (EDIT) Oh, almost forgot! Our county road markers, which are just these little green signs attached to the backs of stop signs. These are pretty much gone in metro Atlanta now, but seem to still be plentiful in the southern part of the state. Yeah, US 80 in Phenix City has them too, though of course it's a blank US shield instead of an Interstate shield. So weird. I used to wonder why breakdown lane driving was not legal even after the highway expansion, but then I learned that it was very dangerous. In British Columbia ... Intersections with multiple signal body colors aren't uncommon either. Are those provincial installations, though? I'm curious to know how common it is outside of Minnesota to see separate signage for snowmobiles. Not my state but California's little white signs that give the name of each and every obscurely known creek, wash, gulch, and ditch in the state. That's a city install, but I have seen mixed color signals on roads that were maintained by other authorities as well. I assume the MOTI is at least partly responsible for the standards that led to their usage. If it would make you happy, once I'm home from work, I'd be happy to find a provincial install. I'm sure there's more than a few out there, although they're still pretty rare. My point was simply that I've never seen mixed color signal bodies in the US or other parts of Canada at one intersection, that wasn't just a one-off thing. You can see these in other western states as well. WSDOT maintains four different freeways with 24-hour HOV lanes, and "freeway entrance" signs are used in at least WA and NV, though only the latter has similar standards for route markers on the same post. WA-99, a surface arterial for most of its length, has a significant stretch of 24-hour HOV lanes along the curb. Are there other states with surface roads that have 24-hour HOV lanes? If it would make you happy, once I'm home from work, I'd be happy to find a provincial install. (1) I'm not unhappy as it is. (2) You don't need to worry about making me happy. (3) It probably wouldn't make me any happier anyway.